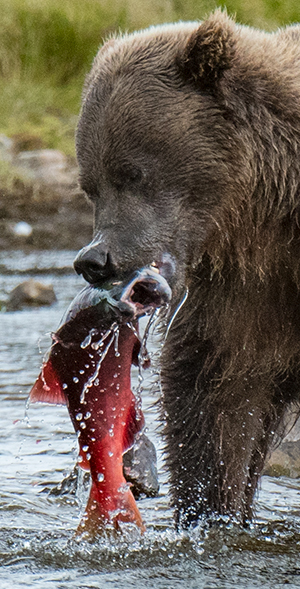 Join us in early August 2019 as we position our group to capture exciting images of giant Katmai brown bears feeding on a massive run of sockeye salmon. 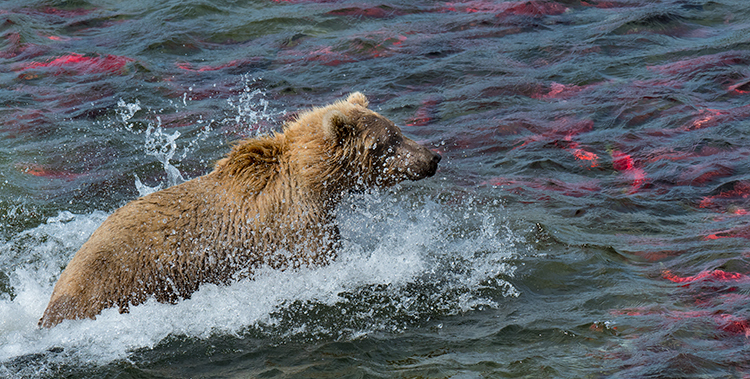 We are talking about a run of salmon that stretches for miles, coloring the streams red. 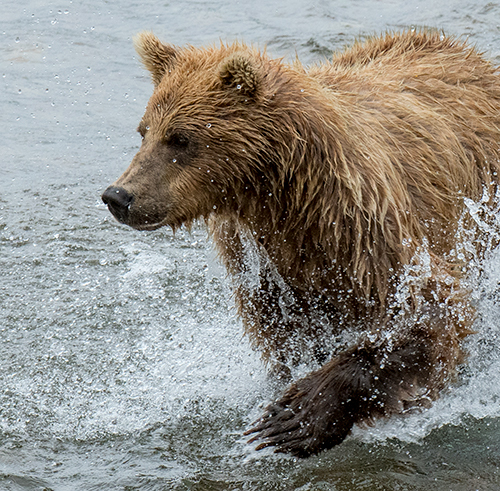 Bears come from throughout the region – trained by their mothers to converge on an area where two large creeks come together and the salmon run must pause as each fish sorts out which drainage to ascend for spawning. 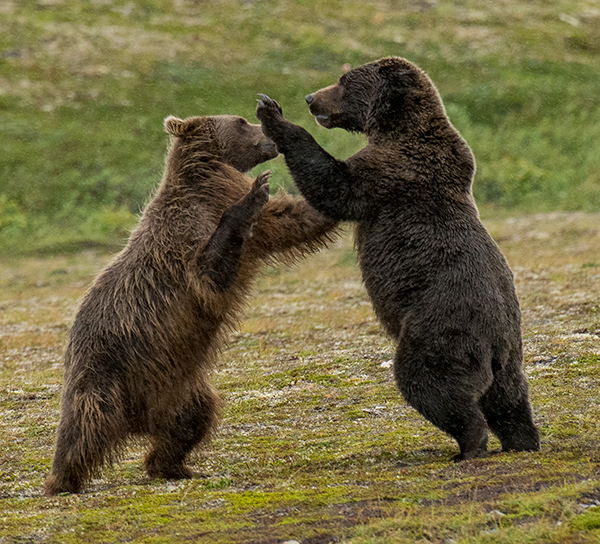 All those bears, which are used to a solitary lifestyle, converging on a relatively small area results in some rather interesting interactions. All good for photography. 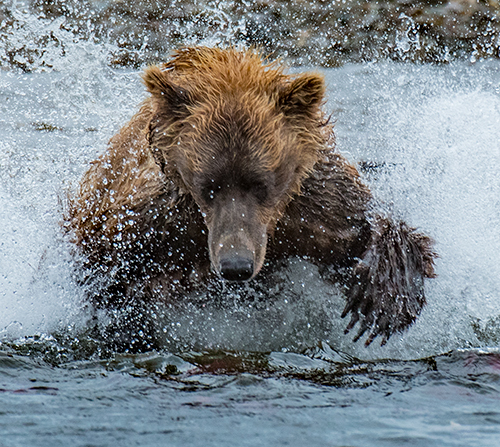 Bears are coming and going from the prime fishing areas all day long – jostling for position – dashing into salmon filled waters – or just calmly fishing. 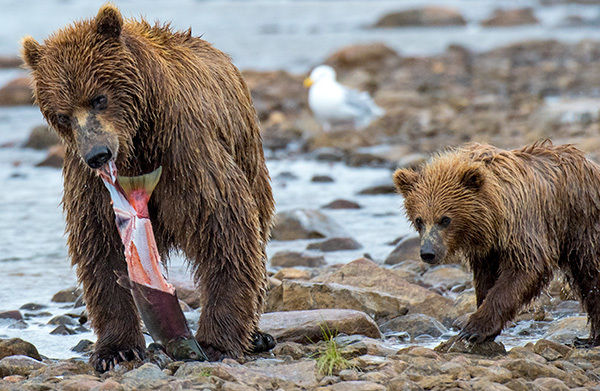 Mothers are teaching cubs to fish – and making sure they are eating a lot of salmon. 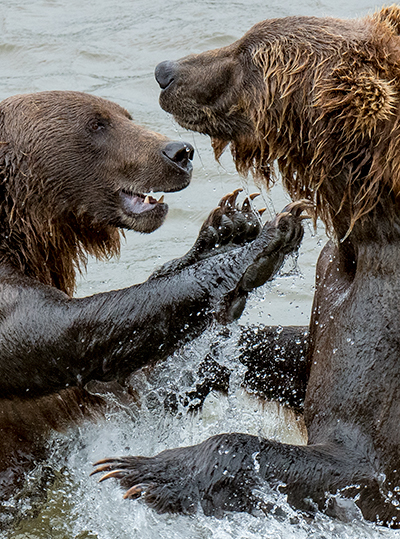 And, just when you think you have enough close-up images of bears fishing or sparring, we’ll change positions. And everything will look different. 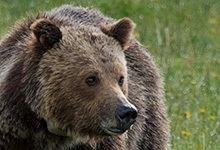 We have even found ourselves with bears at every angle! It was hard to know where to point the lens! 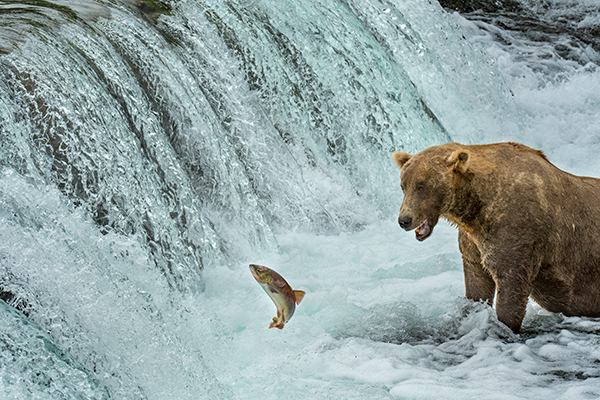 And, if we’re making good progress, and the salmon run active at Brooks Falls, we’ll take a day to fly down to the falls and photograph from both along and below the falls. 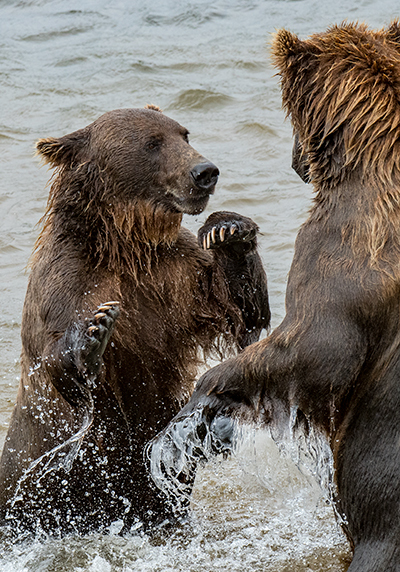 A whole new set of angles, bears, and fishing gymnastics! 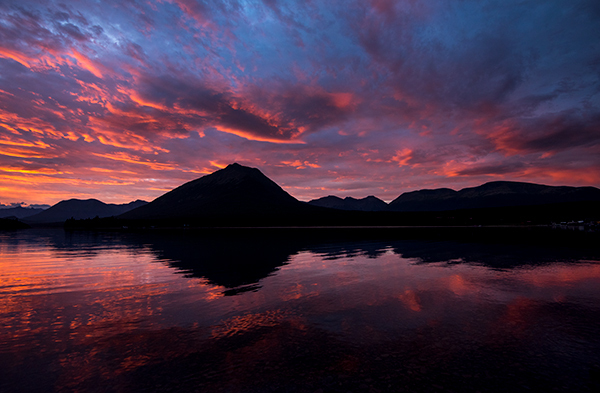 We’ll base in a small family owned lodge on the shores of Lake Clark deep down inside Lake Clark National Park. The only way in and out is by plane or boat. The setting itself is stunning! The food is great! 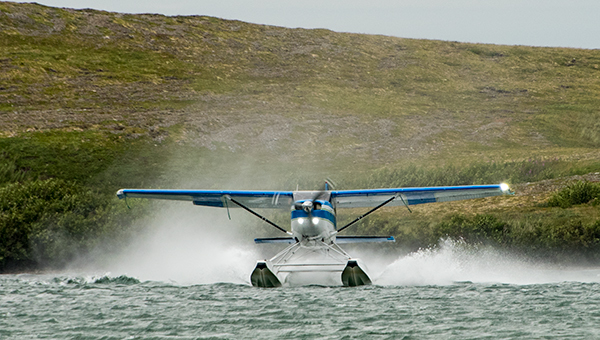 Every day we’ll board a set of float planes (3 of us to a plane) after breakfast and head out to find bears. 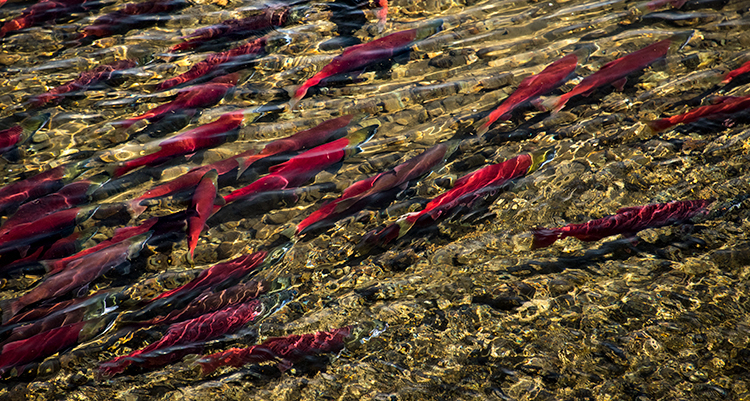 Where we go is determined by both the progress of that huge run of sockeye salmon – and the weather. 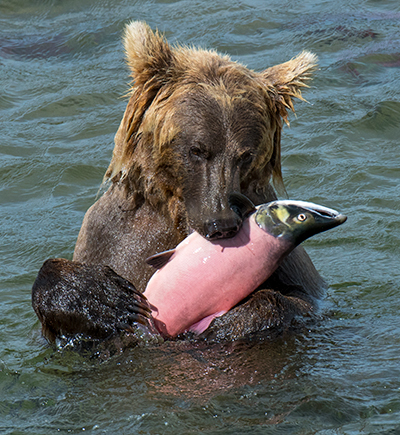 Most of our photography will take place in Katmai National Park. 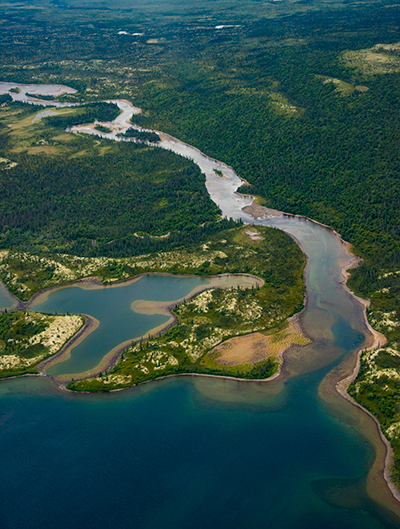 Getting to the locations involves flying over beautiful and inspiring wilderness. And you’ll want to photograph from the planes as we move about! 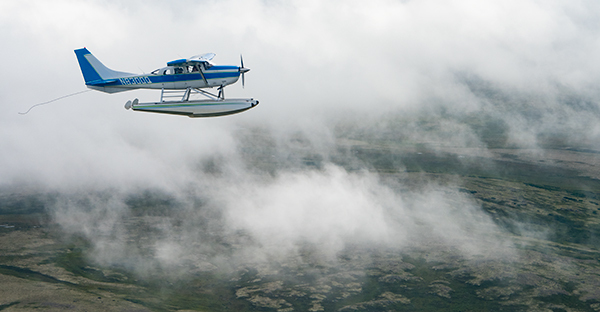 We have built in 5 full days of float plane based photography. We didn’t want you to come that far and have a bad day with the camera, or encounter weather, and come back feeling like you didn’t accomplish your mission. We’d rather you had so many good images that you couldn’t decide which ones to work first. This is a rugged adventure. You’ll spend your days wearing chest or hip waders. You’ll pack your gear (cameras, lenses, tripods, etc.) from the float plane to wherever we set up for photography. There could be a stiff wind. It might mist or rain some of the time. We’ll need to know you are up to that before you sign up! 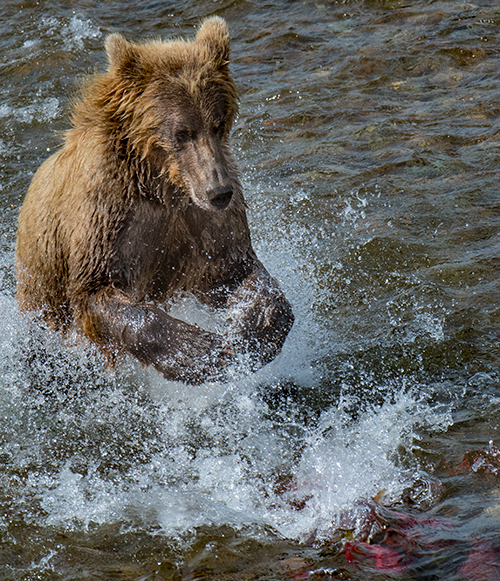 Price includes transfers to/from airports, flights between Anchorage and Lake Clark National Park, lodging for six nights at Lake Clark and 1 night in Anchorage, park admissions, all breakfasts, all dinners, all lunches except on August 4 and 10, five days of float plane outings to photograph bears. 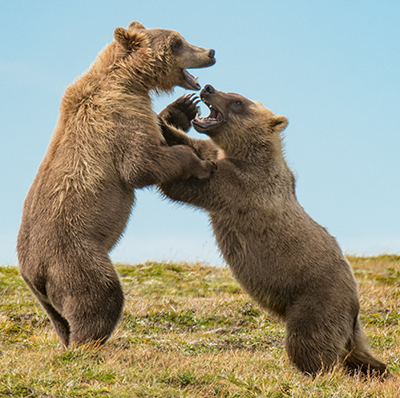 Spring in Yellowstone means babies. Little bison, with umbilicals dangling, learning to romp. Elk quietly giving birth away in secret places. 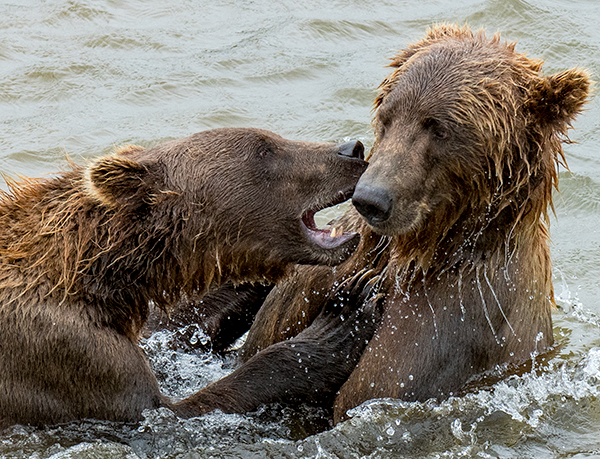 Bears leaving hibernation with their young. All against a backdrop of new green grasses and wildflowers against peaks, still capped with snow. And water gushing down rivers and over waterfalls. Thermals, including geysers, performing for our lenses. Are you coming? 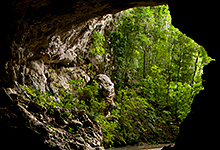 Contact us about private adventures. 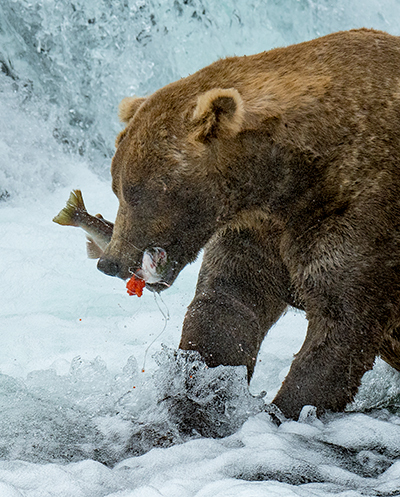 This float plane-based adventure will take us deep into the Alaskan wilderness where we'll put ourselves in position for up-close and personal photography of bears fishing for salmon - and jostling with each other. 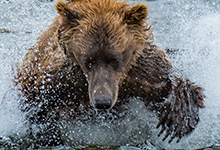 This is a rugged adventure that will send you home with countless great images, both of the bears and of this great wilderness. Wild Bunch and the Mara Crossing! 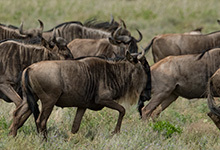 When the great Serengeti Migration reaches the Mara River in the Tanzania/Kenya border region, the millions of wildebeest and zebras have to cross. In that river, crocodiles await. What follows is high drama. What a fitting safari for our Wild Bunch. Oh, and we'll weave in some other spectacular parts of Tanzania, including the predators of the Central Serengeti, the Ngorongoro Crater, and more! 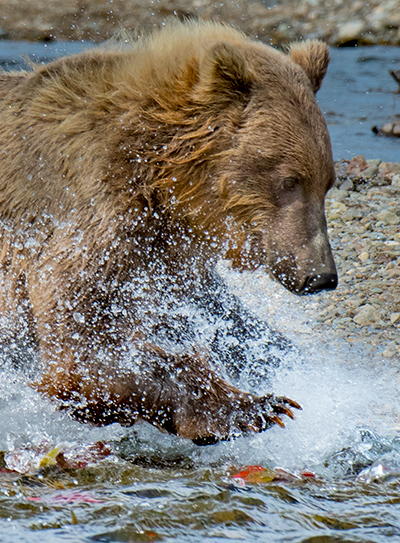 If you are wild enough, check with us to see if you qualify! 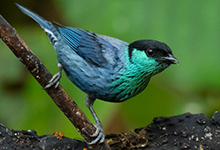 Journey with us through Ecuador's Chocó Cloudforest Ecosystem to find exciting birds. We have choreographed an adventure to help you build an outstand collection of images of colorful and exotic birds - including a number of unique hummingbirds! And, we'll have our very own bird "whisperer" along to help us find them! 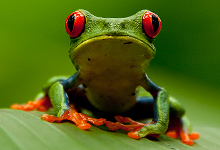 Did we mention nightwalks for frogs and spiders? And butterflies and waterfalls? Frogs and waterfalls. Beaches and canopy trails. And many hours on boats photographing exciting birds and monkeys. This is a great adventure for working on bird and wildlife techniques, mastering the challenging light of the rainforest, macros, and landscapes. Hummingbirds with flashes and night photography with LED lights! Timed to meet the great migration in the Serengeti, our safari takes you to some of the great parks and protected areas in northern Tanzania in search of lions, zebras, giraffes, cheetah, hyenas... Of all our itineraries, anywhere in the world, this one has the best reviews - and is a real life-changing experience! If you'll only be making one photography foray into sub-Saharan Africa in your life - this is the trip! For 2020, we have woven together an itinerary that gets us to some seldom visited parts of the Galapagos, some of our favorite places, and the spots where we can photograph penguins, tortoises, flightless cormorants, all kinds of boobies, breeding frigates, marine and land iguanas and more! We have 10 nights at sea! Don't forget that this trip always fills early - you won't be able to join it in the 12 months before departure! 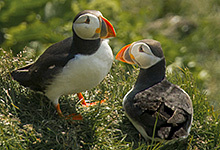 Glaciers, waterfalls, puffins, geysers, volcanos, amazing landscapes, black sand beaches, and nesting sea birds! 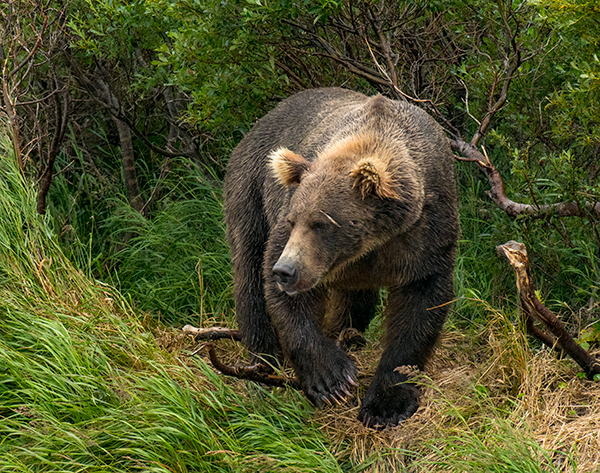 Join us as we explore Iceland, cameras in hand. 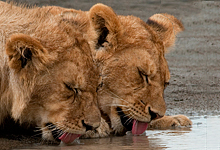 It's time to grab your spot on our 2020 Kenya Photography Safari. We have secured a set of logistics to put us in great positions to photograph great wildlife, superb landscapes, and some unique cultures. Your chance to create images of three kinds of giraffes, and several species not found in other southern and eastern Africa safari destinations. Our key destinations include Samburu, Ol Pejeta Conservancy, Mount Kenya, Lakes Elementaita, Nakuru, and Naivasha, and the Masai Mara! Turkey! Where the East meets the West - Asia and Europe divide Istanbul at the Bosporus! Blue Mosque. Spice Market. Grand Bazaar. Cappadocia. Ephesus. Hierapolis. Sagalasos. 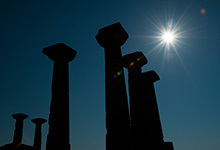 Aphrodisias. The Acropolis. Temple of Athena. Assos. Troy! The list goes on! Throw in incredible artisans - and some of the best olives and olive oil on the planet - and a well executed photographic adventure itinerary! Let's go! Botswana just after the rains. Swollen rivers and wildlife along the edges. Birds abundant and nesting. Animals fresh as tourism stops during the rains - we'll be the first groups in and we are going places no one else will go. 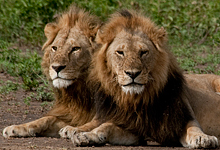 Count on great opportunities with hippos and elephants, antelope, zebras, wildebeest, cats and dogs. Small group by design. Read the itinerary and then contact us! Winter brings out the "ice" in Iceland. Glaciers photograph with strong blues. Waterfalls are often ice encrusted or even frozen solid. Ice, stranded on the beaches is in a better position for backlight - and looks much more dramatic in close-ups. And, Iceland presents an outstanding opportunity to compose great images of the Northern Lights at nigh! We'll also take time to explore an ice cave! Belize and Guatemala was ground zero for the ancient Maya civilization - which was engulfed by a tropical rainforest after its collapse. We'll visit Mayan sites, explore caves, photograph birds and monkeys, and work macros of butterflies, ants and colorful plants in this beautiful and inspiring region. 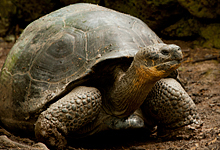 For 2022, we have woven together an itinerary that gets us to some seldom visited parts of the Galapagos, some of our favorite places, and the spots where we can photograph penguins, tortoises, flightless cormorants, all kinds of boobies, breeding frigates, marine and land iguanas and more! We have 10 nights at sea! Don't forget that this trip always fills early - you won't be able to join it in the 12 months before departure!